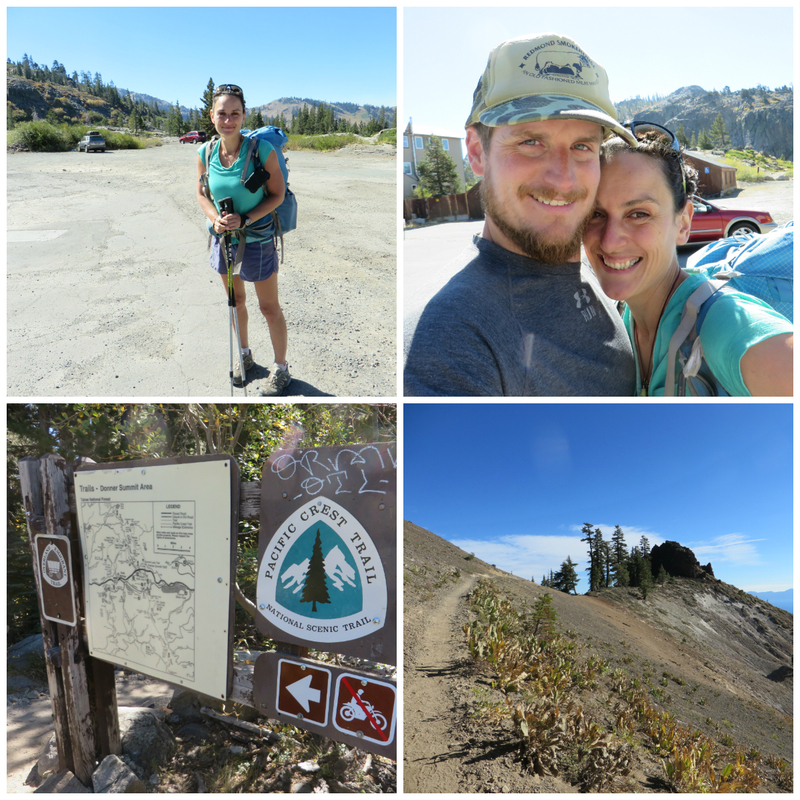 Pacific Crest Trail Chapter II: Back in California! After reaching the Northern Terminus of the Pacific Crest Trail at the US/Canadian border, it is time to say goodbye to my friends. While Mr. President, Brunch, Brad and Bowie are hiking on into Canada, me and Dutchess are hiking back 30 miles to Hart’s Pass. We camp 10 miles before Hart’s Pass that night and we even get snowed upon! When we arrive at Hart’s Pass, Meander is still there, doing trail magic for the next bubble of hikers coming through and we help him out. The next morning, he give us a ride all the way down to Wenatchee WA, where Dutchess’ mom Val picks us up to drive us home to Hermiston, OR. Here, we shop and shop and shop to get all my resupply done for the remaining 1155 miles through California. A hell of a job but the Henderson family help me getting through this! Thank you so much Val and Dutchess for all your efforts and hospitality! Dutchess drives me all the way down to the town of Truckee CA, and drops me off at the Donner Pass trail head. We say goodbye. This feels so strange. I’ve been hiking with my friends for so long. And now, I am by myself again. Nobody around to talk with. To laugh with. To sing with. To hike with. It’s just me and the trail. But luckily I will see Dutchess again soon, we are meeting again at Echo Lake, only 60 miles further down south. 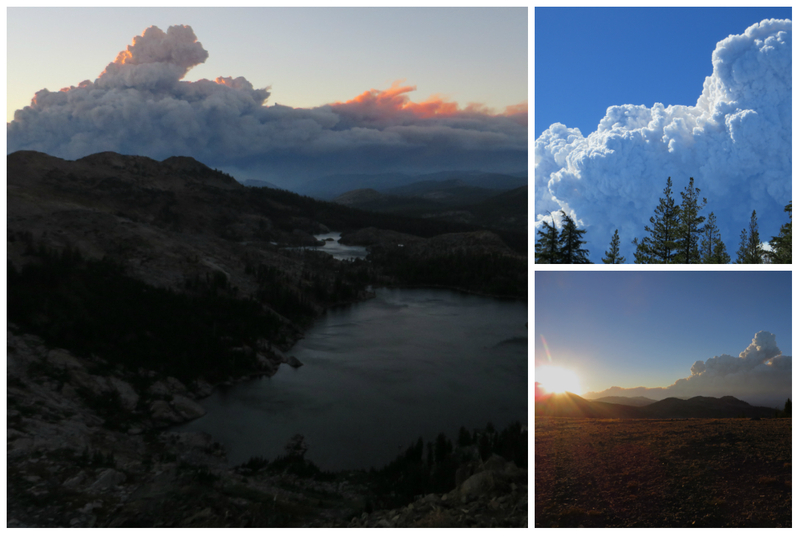 The first (half) day, I hike 19 miles through a thick smoke, caused by the 97.000 acre King fire in the Eldorado National Forest near Sacramento. It is hard breathing and the sky is hazy. Smoke caused by the King fire. The clouds are enormous. I camp out on a ridge, where the wind picks up in the night, keeping me awake until the morning. But it also blows away all the smoke! 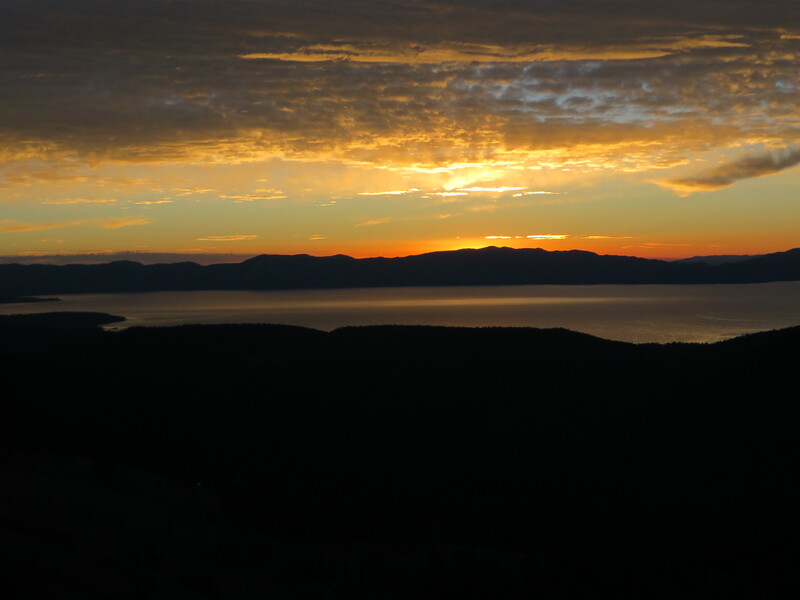 In the morning, I wake up to an amazing view of Lake Tahoe, with a stunning sunrise. Despite the fact that the wind kept me up all night, I feel today is the day to set a new PR (personal record). I have 41 miles left to get to Echo Lake, and I want to hike it all in one single day! I make this decision at around 6 pm, so I call Dutchess from Dicks Pass, where I have reception and ask him to pick me up from Echo Lake. I’m going to make it between 10 and 11 pm, I tell him. Which means I have to hike into the night. I’m not afraid of hiking in the dark by myself. It’s just the same as hiking in daylight, only with the lights off. I do this often, to make my miles for that day or just getting to that one camp spot, or just to catch up with the people with whom I’m hiking with. There is nothing to be scared of. I realized that the only things I’m scared of are my own thoughts of what could be out there. What could be behind that tree or could be in that deep darkness. There is really nothing to be scared about. The days get shorter, I notice. Sun sets at around 6.30 pm. I search my pack for my Petzl headlight. My little visor into the night. It’s 7 pm and it’s still 10 miles to Echo Lake. My average pace is 3 to 3.5 miles per hour so I will arrive around 10.30 pm or so. Still a reasonable time for a 41 mile day! But the trail gets harder and harder. Rocky. Steep. Up and down it goes. I hike pass a few lakes I don’t see, only hear. The wind is blowing the water into ripples and against the shoreline. I hike pass Lake Aloha. A stunning lake, Dutchess told me. I shine my headlight into the darkness. Yep, beautiful indeed! Then I get the feeling I’m not on the Pacific Crest Trail. There are no markers to follow anymore. There are an enormous amount of side trails here and I’m on one of them. It is very unclear to me where I exactly am. I check both of the Halfmile and Guthook apps. The GPS doesn’t work. Great. Just great. Oh this is not good and I start to freak out a little bit. It’s dark, I’m in a dark forest, I’m lost, I got Dutchess waiting for me, I’m super tired, this is not good, not good at all, what am I thinking, hiking 41 miles in a day, what am I doing here, why is the wind howling so much and why is this damn trail giving me such a hard time right now!?! And what’s that behind that tree?! I’m freaking out a little bit more now. Ok, I tell myself. Take it easy. Breathe. Stop. I have weak reception and I get one text out to Dutchess, telling him I’m lost in the woods and that I’m going to arrive later than planned. He texts me back that he is sure I will find the trail again, that I just have to take my time. He will be there to pick me up, no matter what time. This reassures me. I track back my steps until I get to a junction. In the dark, I totally overlooked a marker. Now I’m back on the trail again but I lost a lot of time. The trail is not giving me an easy finish, rocky and steep as it is I slowly make my way down to Echo Lake. It’s past midnight. Then my headlamp starts to fade. Oh no! I forgot to take an extra set of batteries with me. I’m getting thoroughly tested today. I can only see the trail very dimly. I pray that I make the remaining 3 miles, which is another 1 hour (or 2, in the pace I hike now) of hiking. Then, I finally see the lights of the Echo Lake boat house, where I agreed on meeting Dutchess. At 2 am, after hiking 41.2 miles, I finally arrive. Every single muscle in my body hurts. I sink into the seat of the warm car and we drive to South Lake Tahoe, where I take the best shower in my entire life. I stand under the hot water for an hour, allowing my muscles to relax. That night, I sleep in a real bed, and fall into a deep, deep sleep the moment I lay my head to rest on the pillow. Wow, no words. Wat een verhaal zeg, jeetje, je zal veel zenuwachtige momenten hebben gehad. en wat een doorzettingsvermogen! 41.2 Miles ongelofelijk! Erg knap! Spannende en persoonlijke verhalen! Lezen als een jongensboek!